Amongst the ever-growing described species of Anthiines (subfamily of basses, groupers, Family Serranidae) encompassing the fancy basses my fave is the wide-ranging Lyretail. Beautiful and interesting behaviorally; it is a hardy aquarium addition given a few caveats, provisions; which we’ll carefully go over here. This “Goldie” makes for a fabulous schooling species if you have the room (125 plus gallons) for a small shoal; even more spectacular should you possess a system of hundreds of gallons that can support more than one male. 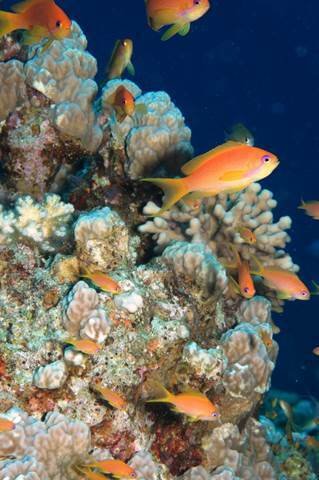 Distribution/Sources: P. squamipinnis is found on shallow reefs (10-30 meters) through-out the tropical Indo-Pacific; Red Sea to S. Japan down to N. Australia; everywhere super-abundant in its distribution. 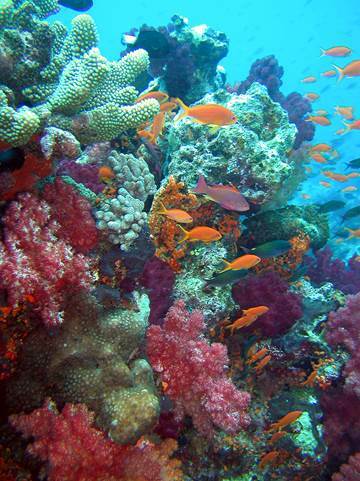 Best specimens hail from the Red Sea; but the western trade imports this fish mostly from Indonesia and the Philippines. IF you can find them out of Fiji; do so. 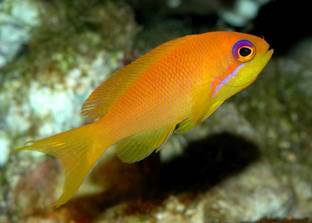 I’ve often thought that Pseudanthias squamipinnis functions as a key intermediate, food-web organism; twixt various zoo-plankters species and the numerous larger fishes and predatory invertebrates that include it in their diets. I’ve oft-remarked that they are like so much “aquatic popcorn”. Males grow to nearly half a foot in length, females to half this. 1) All specimens at your dealers should be active, aware; none having “private parties” in the corners. 2) None should have obvious open sores, scrapes. These often portend protozoan and overly-stressed infectious diseased animals. These rarely rally; instead dying en masse over days to weeks time. 3) Look for “mid-size” stock… three inchers (overall length) are ideal… smaller ones die easily, and ones collected over four inches get too beat in shipping and adapt poorly to captive conditions. 4) Better to place this fish as either all specimens at once, or smaller, sexually undifferentiated individuals and more females at a later date. 5) DO keep this fish in a good numbered grouping! Ten or more specimens will provide enough individuals to approach their massive numbers in a school in the wild; granting you continuous appreciation for their interactive behaviors. 6) Use the standard “acid test” of purchasing any animal livestock: ask the dealer to feed the prospective buys in front of you; the sorts of foods you’ll be using. Leave all there if they are not to a number eating these foods. This Anthiine is a great reef tank addition as well as fitting into peaceful Fish Only and Fish Only with Live Rock (FOWLR) systems. You do need to be cautious with tankmates that might grow to seek them out as prey… large puffers, triggerfishes, basses and such. Unless the system is several hundred gallons in volume you’ll want only one male with a few to several females, and only the one species of Anthiine in the system. System: The Lyretail Fancy Bass is found at reef crests and drop offs in front of branching stony corals that it can dive into for cover should it espy a menace; you should emulate such a habitat with plenty of circulation and hiding spaces. Foods/Feeding/Nutrition: These fish are zooplanktivorous, eating all the light hours on small crustaceans in the water column. You can successively approach and encourage such foraging by a few times daily offerings of live and/or frozen/defrosted copepods, brine, mysids and such. Supplementing these items with a large, vigorous refugium with a DSB, rock, macro-algae is ideal. Adding an automatic feeder with small pelleted foods of high quality even further assures adequate nutrition. Do feed as many times per day, in small quantities as practical. Reproduction: As in the wild, this Fancy Bass reproduces most every evening… you can bring this on by dimming the lights regularly; and if you’re interested, commercial egg collectors or DIY can be fashioned to collect their spawn. Just watch for their behavior toward the evening… it is very quick; observing the male chase a female in turn up towards the surface where they release their gametes. IF you should lose your one or alpha male; no sweat; the next larger and/or aggressive female will convert to a male in a week or so’s time. Cloze: The Lyretail Goldie can be the social butterfly of your system; dancing a group ballet of warm oranges and pinks. It is a great choice for peaceful systems of all sorts; just needing what most Anthiines need: Room to move, interact and get away; appropriate foods offered a few times per day; and a dearth of competitive and predatory tankmates. Though not the most spectacular member of the subfamily of Fancy Basses, Pseudanthias squamipinnis is my favorite species. 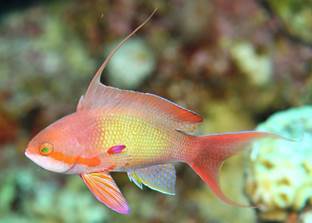 We recently got some Lyretail Anthias for our saltwater tank. We got a large male (4”) and two small females (1.5”) from the LFS. We ordered two more females online to make a bigger group. We have the 2 groups of fish in their own quarantine tanks since they came from different sources. The two females we ordered online are pretty big (2.5”) and one of them has a spiked/pennant dorsal fin. Does that indicate the fish has started turning into a male? If so, would the process reverse if we housed that fish with our existing male? I’m a little worried about putting them together as I’ve heard males are aggressive to each other.